Early that Sunday morning, the runners took the Staten Island Ferry from Manhattan to Staten Island to prepare for the race. Gathering in the parking lot of the Richmond County Bank Ballpark, home of the Staten Island Yankees, we got ready to race then lined up on the road outside the ballpark. 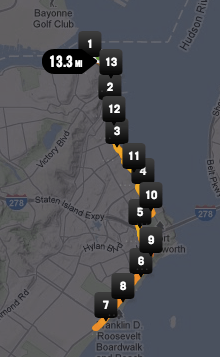 As the race started, we headed north before turning around and running south along the roads of Staten Island. For the most part, the course was similar to last year’s race, but altered enough to make it a little more challenging. Previously, the one big hill in the course was in the middle of the run, where we ran down it then back up. This year, the downhill came earlier at mile 5 and the uphill at mile 9. By having the uphill later in the race, it was more challenging to run up it, but I was able to recover and keep going to return to the ballpark. As I crossed the finish line, my time was 1:54:18. While my goal was to run the Staten Island Half Marathon in under two hours, I was able to not only achieve my goal, but I was able to beat my previous PR, set only a month before, by 11 minutes, a feat I could not have achieved without the training I’ve received by being part of American Cancer Society’s Team Determination. With the Staten Island Half Marathon completed, I have finished four out of five of the Five Borough races, giving me automatic entry into the 2013 NYC Half Marathon. 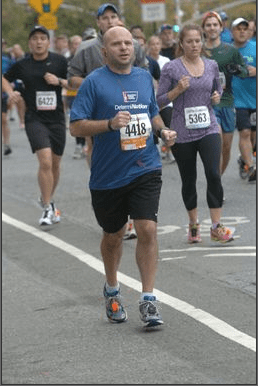 It’s alost my last race before the NYC Marathon, which I will be running for the second time. To support me and Team Determination, please consider donating to show your support and help ACS research to end this disease here.